25,000 visitors at International Vision Expo West, #VEW2016 have an opportunity to see and try first hand the worlds only through the eyelid and trans-scleral tonometer which allows to measure IOP independent of the corneal biometrics. Tonometer DIATON is irreplaceable solution for children and adults, even patients wearing contact lenses can get accurately screened for glaucoma. Diaton tonometer pen is handheld, non-contact (no contact with cornea), latex-free (no tips or covers), painless tonometer. Groundbreaking tonometry technology from BiCOM Inc., now allows Emergency Departments and Rooms (ED / ER) in hospitals to accurately screen patients of all ages for elevated intraocular pressure (IOP) through eyelid and sclera, without touching the eyeball direct and without need of numbing drops. Unique tonometer Diaton eliminates the risk of infection or scratching the cornea and obtains IOP independent of central corneal (CCT) properties or influence of past eye surgeries as reading is done over the upper eyelid and sclera, making it user and patient friendly. Home of Diaton Tonometer, BiCOM Inc., is at Medical Design & Manufacturing (MD&M) East Expo in Jacob Javits Center, New York. The MD&M East Expo and Conference is the largest, most important and comprehensive medical design & manufacturing event on the East Coast. It’s the gathering point for more than 500 leading medtech suppliers and manufacturers, including 3M, Abbott, Nypro Healthcare, Phillips-Medisize, and Stratasys. BiCOM Inc., is a home of groundbreaking transpalpebral glaucoma diagnostics technology through the eyelid and sclera Diaton tonometer used by ophthalmologists, optometrists and other healthcare professionals in over 60 countries. Diaton tonometer featured at ASCRS ASOA Annual Meeting in New Orleans at Exhibit #2023 Sonomed Escalon and BiCOM Inc. Diaton allows to obtain cornea independent IOP with unique transpalpebral and transscleral tonometry, which presents an advancement in ophthalmology and glaucoma detection overall. Diaton Tonometer presents a unique advancement in glaucoma diagnostics by allowing eye care and other professionals to accurately measure intraocular pressure (IOP) through the upper eyelid and sclera, without direct contact with an eyeball and without influence of corneal biometrics on the accuracy of the readings. Diaton readings are not influenced by central corneal thickness (CCT), corneal crookedness, scarred cornea or corneal edema vs all other cornea dependent devices such as Goldmann, Tonopen, Icare, Perkins, Accutome, Schiotz and other tonometers that measure directly via contact with the cornea. With Diaton even contact lenses do not need to be removed for accurate results as the reading is done above the edge of the contact lens. This patient and user friendly tonometry device allows quick, painless and efficient glaucoma screening in children and adults. 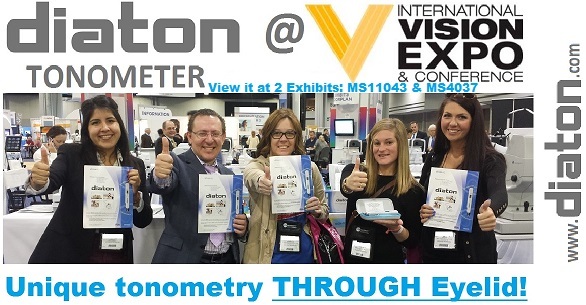 Diaton is showcased by BiCOM Inc, and colleagues at the International Vision Expo East in New York to 35,000 visitors at the medical pavilion, exhibit #7034. Long Beach, NY-A handheld tonometer that measures IOP through the eyelid and over the sclera is proving to be helpful for ophthalmologists faced with patients who are apprehensive about seeing an instrument approaching their eyes or who have a corneal abnormality, according to several ophthalmologists who have studied it. Glaucoma is the leading cause of global irreversible blindness. Blindness ranked 3rd (after cancer and heart disease) as people’s major fear. BiCOM Inc. with its Non-Corneal and Through-the-Eyelid DIATON Tonometer is challenging the “Sneak Thief of Sight” through awareness and screening events. BiCOM is advising and guiding all of its distributors located in over 60 countries in North and South America, Europe, Asia and Middle East to participate in the World Glaucoma Week on March 6th-12th through Screening and Awareness campaigns. Since IntraOcular Pressure (IOP) is one of the major risk factors for developing Glaucoma, early detection is the key to preventing blindness.